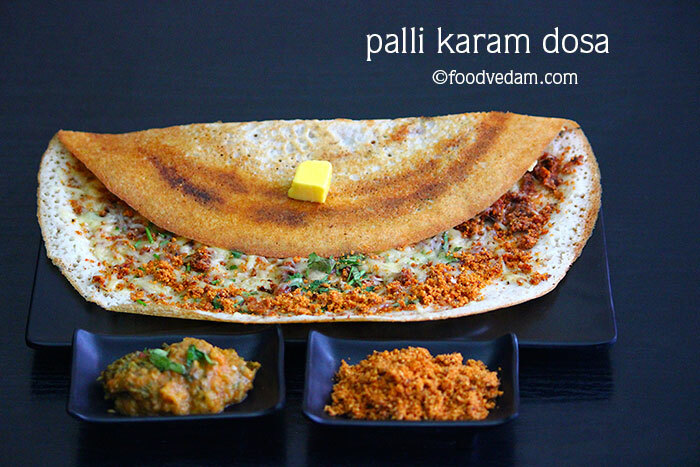 Palli Karam Dosa Recipe with step by step instructions.తెలుగు వెర్షన్. we rarely eat dosa at dosa stall.last week I was too busy that I couldn’t prepare dinner at home.my husband said, “let’s go out and have dinner”.I suggested him street food rather than going restaurant as it was already half past 11 then.we went to taste the street food.I was surprised to see the crowd there.I saw more than 10 dosa stalls, momo stalls, shawarma etc.first we ate chicken momos and then moved to dosa stall and ordered one cheese dosa and one palli karam(peanut spice powder) dosa which I never tasted before.the taste was really amazing.I had decided to make that immediately and post it on the blog.I prepared it and the outcome was too good. once a breakfast has now become all day meal.now it has become dinner more than a breakfast.I knew about only few variety dosas when I was a child.but now we have hundreds of variety dosas.it has become one of the popular street foods now.I always keep the restaurant flyers that come along with newspapers so that I can find the names of new variety recipes and try them at home.so far I have tried about 10 dosa varieties.they all came out really good.posted few of them.will post other varieties soon.I hope you try and enjoy this recipe. Add cumin seeds, coriander seeds, dried red chilies and fry for a minute. Add tamarind, roasted peanuts, garlic cloves and fry for a minute and turn off the flame. Put salt, grind into a powder and keep aside. 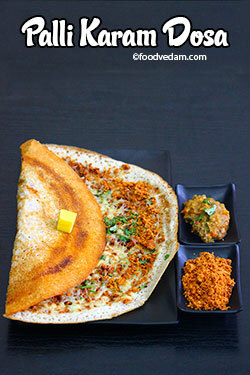 Heat dosa pan, pour 2 spoonfuls of dosa batter and spread it to the edges of the pan evenly. Let it be on high flame for 10 to 15 seconds and pour ghee around dosa. 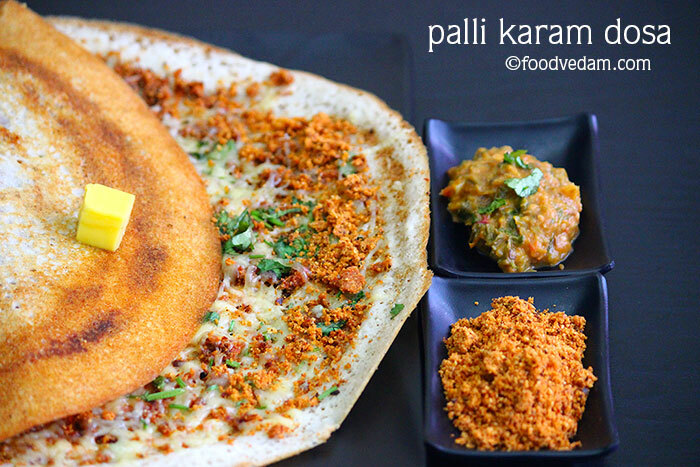 Add palli karam, shredded cheese on dosa and leave until bottom of dosa is nicely roasted or until the cheese melts. Add chopped coriander leaves, fold dosa and serve hot.